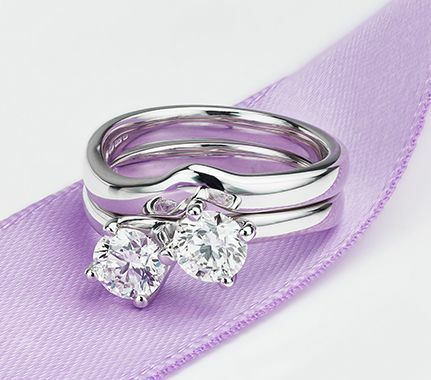 Discover elegantly styled two stone engagement rings. Uniquely designed and crafted with meticulous attention to detail. Enjoy a fascinating choice of 2 stone diamond rings including twist styles, birthstone designs, antique effects and a wide range of diamond shapes. From the modern round brilliant diamond in two stone designs to heart-shaped, marquise-cut and pear-shaped 2 stone ring designs. Discover the unique and exclusive beauty of the Josephine, double heart-shaped diamond engagement ring. Styled with two perfectly matching hear-shaped diamonds, this distinctive ring design is available in a choice of carat weight options and stands apart as the Serendipity signature diamond engagement ring. Unique and exclusive heart shaped engagement ring design. We begin with a perfectly matched pair of heart shaped brilliant cut diamonds in one of many choices for carat weight. 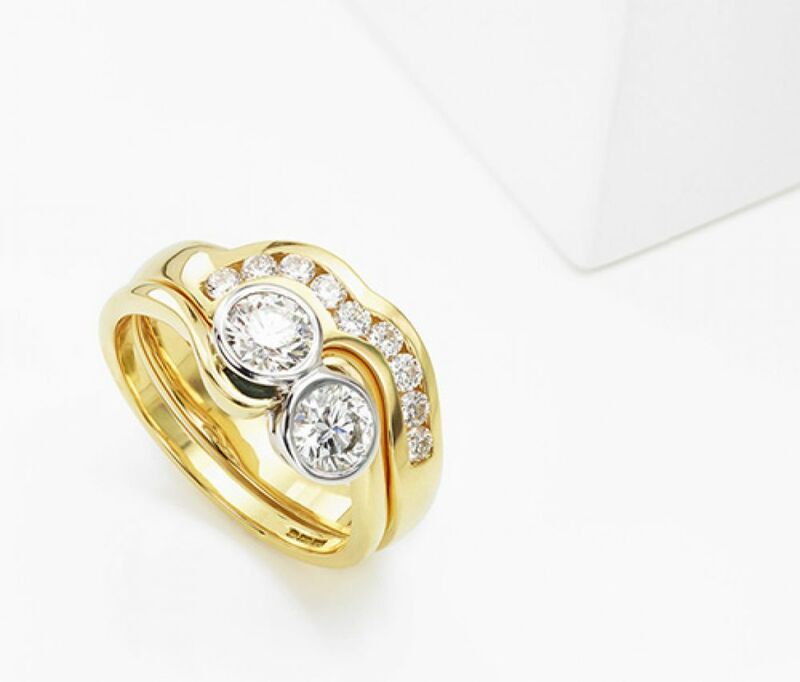 Each ring is crafted within this unique design which features elegant crossover shoulders. Please allow around 4 weeks for this ring design. Beautifully presented as shown below. Unusual 2 stone flowing diamond engagement ring, with unique curling design holding either of two carat weight combinations of round brilliant cut diamond. Naturally flowing from shoulder to diamonds, the style of flow is both original and captivating. A matched pair of round brilliant cut diamonds. Select either 0.26 carats (3.5mm / 3mm diamonds) 0.60 carats (4.5mm / 4.0mm diamonds) for this unusual and modern engagement ring design. Don't worry about the wedding ring - we have various suggestions for beautiful wedding rings which can be made to compliment this design. Approx. 3 weeks for delivery. Introducing the Autumn, two stone diamond twist ring. This elegant design is finely crafted in a choice of precious metals. Two brightly faceted G colour SI1 clarity diamonds sparkle within claw settings. Each diamond is edged by an elegant twist design flowing from graceful shoulders with a comfortable court shaped band. Styled in a choice of 18ct Gold, Palladium or Platinum, the Autumn ring is set with 2 x 3mm round brilliant cut diamonds, graded G colour and SI1 clarity with a total carat weight of 0.20cts. Unique and distinctive 2 stone diamond ring which features round brilliant cut diamonds in rub-over settings within a rounded profile design. Choice of two diamond weights. Either 3.5mm or 4.2mm diamonds (0.30cts total) or (0.60cts total) Substantially weighted ring mount - either 5.8g or 7.0g in 18ct Gold. One of our more unusual designs. 2 diamond twist engagement ring featuring a favourite 4 claw twist setting, with flowing slender tapering shoulders and court profile band. Two round diamonds, Four claw settings, Twist design. Solid shoulders, Court profile, G colour SI1 clarity. Available in 18ct White Gold, 18ct Yellow Gold, 950 Palladium and 950 Platinum. Wood boxed, gift packaged. Approx. 14 working days delivery. Uniquely styled 2 stone diamond engagement ring, created with a matching pair of brilliant cut pear shaped diamonds. Created with 2 perfectly matched, paired brilliant cut pear shaped diamonds, this elegant design boasts a completely unique styling, with diamonds face to face above beautiful crossover shoulders. Please allow around 4 weeks to hand craft this design around your chosen carat weight of pear shaped diamonds. Wood boxed and gift packed as shown below. Accomplished 2 round diamond engagement ring, set within secure 6 claw modern settings above elegant plain crossover shoulders. Six claw setting. Two stone design. Round brilliant cut diamonds. Twist styling, with tapering shoulders. Court profile band. Available in most metal choices. Can be fully customised - enquire for further details. Approx. 3 weeks for delivery. Wood boxed and gift packaged. Total diamond weight selected. Exquisitely simple 2 stone round diamond engagement ring with full bezel settings, above crossover tapering shoulders. 2 round brilliant cut diamonds in many size and quality options. We craft full bezel settings to secure and protect a perfect matched pair of round brilliant diamonds. Both diamonds are set side-by-side above crossover shoulders. The ring features a comfort fit court profile band in a range of metal options. Timescale around 3-4 weeks. 2 stone diamond engagement ring uniquely styled with a swirling double bezel to hold 2 perfectly matched round brilliant cut diamonds. 3 diamond carat weight options are provided for this exceptionally unique design. We hand sort and match a perfect pair of round brilliant cut diamonds, before they are set within the opposing bezels connected by their unique swirling setting flowing above tapering solid shoulders. Each ring is carefully crafted within 3-4 weeks before being sent fully insured and beautifully packaged. 2 stone diamond engagement ring with round brilliant cut diamonds beautifully set within 6 claw settings above crossover shoulders. Two round brilliant cut diamonds, Twist detail, Diamonds claw set on either side, 6 claw settings. Available in 18ct White Gold, 18ct Yellow Gold, 950 Palladium and 950 Platinum. Wood boxed, gift packaged. Approx. 14 working days delivery. A fancy two stone marquise crossover diamond engagement ring Two stone design, Marquise brilliant diamonds, G colour VS1 clarity, Cross-over design, Court profile, Choice of diamond weights. Available in 18ct White Gold, 18ct Yellow Gold, 950 Palladium and 950 Platinum. Wood boxed, gift packaged. Approx. 14 working days delivery. Majestic 6 claw rex set 2 stone round diamond engagement ring with elegant tapering crossover shoulders. Elegant 2 stone diamond engagement ring design, with a classic 6 claw rex setting. A matching pair of round brilliant cut diamonds goes into this elegant design, with protective 6 claws around the girdle of each diamond. Additional styling is provided with the crossover shoulders created with a court comfort fit. Approx. 3-4 weeks for completion and delivery. Welcome to the Serendipity Diamonds collection of 2 stone diamond engagement rings. Appropriately positioned, between our solitaire collection and the popular Trilogy range, our two stone diamond engagement rings perfectly nestle within a selection of dazzling ring styles. Experience the beauty of our signature 'Josephine' two stone heart shape ring, or marvel at the unique curves of the 'Flow' diamond engagement ring. Each design receives dedicated care and attention. Made to order. Crafted with responsibly sourced, ethical materials. At Serendipity Diamonds, we personally source and match every pair of diamonds to ensure perfection within your finished commission. Our dedicated experts remain on hand to help at any time, backed by decades of friendly helpful service to ensure the best possible experience.